WHY HAVE PRICES INCREASED SO MUCH? - See our FAQ section for details. Preferred for standard litter boxes. Larger size crystals track less and last longer. Convenient – delivered to your door! Healthier for you and your pet. This is a feature that we think is worth the additional manufacturing expense. There are too many brands out there that cut corners in the manufacturing process and deliver a product that throws off a lot of annoying dust and does not last as long as it should. We have read many customer complaints about dust on various websites. The larger size crystals track less and seem to last longer than smaller sized crystals. Fresh Magic crystals have no added dyed crystals, which are added to some brands for visual appeal. This is primarily because a number of customers over the years have told us how valuable it is to be able to get an advance warning of possible health problems indicated by a pinkish or redish color in the urine. If this occurs, please contact your veterinarian. Discounts on purchases of 2 or more units! ABsorption is what happens when a sponge soaks up urine. The urine remains in the sponge unchanged, the odor still emanates from the sponge, as occurs with standard kitty litter. ADsorption is a chemical interaction whereby a change of physical properties occurs, Fresh Magic® Crystals “AD”sorb urine within a matter of seconds and are dry to the touch. There is no “trapped” odor. It is completely eliminated. This ADSORPTION process also kills bacteria. Non toxic: earth, people and pet friendly. Easy to use, ultra clean and convenient! Less lifting! Up to 80% less landfill waste! No messy urine clumps to scoop. Fill a clean empty litter box to at least 1.5 inches. Maintain litter freshness by regularly stirring the crystals about the litter pan when you scoop the droppings. This extends the useful life of the litter. Every 3 to 4 weeks empty entire litter box. IT’S THAT SIMPLE! MULTIPLE CATS: For 2 cats use same amount of litter as for I cat (at least 1.5 inch), but change litter about every two weeks. For 3 cats change litter about every 10 days. SWITCHING: On rare occasions, a cat may be tentative about switching. 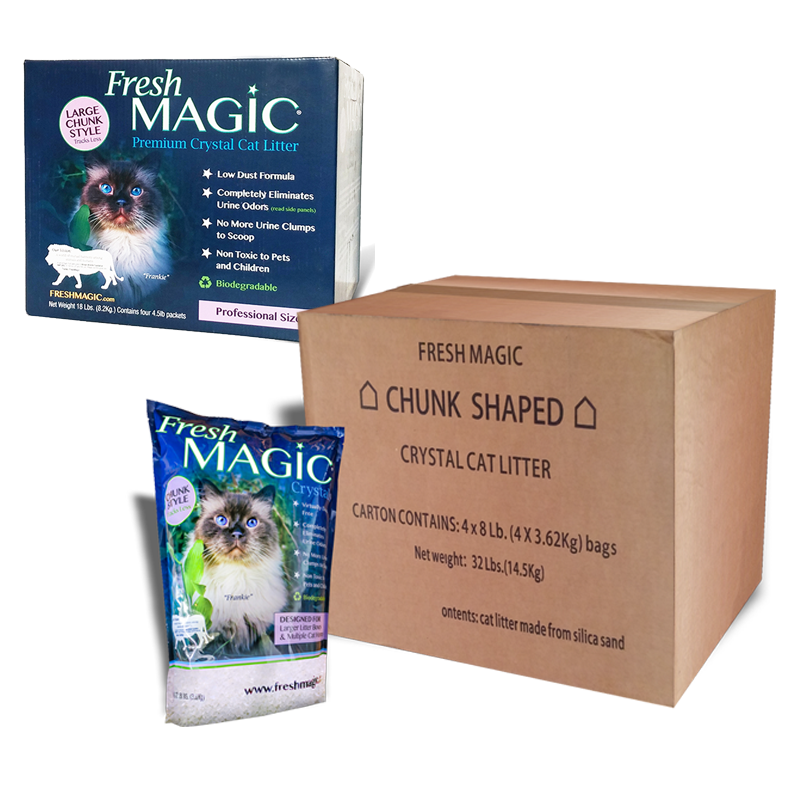 In this case, mix small amounts of Fresh Magic® crystals with the old litter, then increase Fresh Magic r crystals gradually while decreasing the old litter. PLACEMENT: Fresh Magic® crystals continuously ADSORB moisture. Keep crystals in dry area. TEST FOR CHANGE: 20 minutes after scooping, if you notice any urine odor from a distance of 12 inches the litter should be changed.